ADP Overstates 419,000 Job Growth In Past Year? ADP has announced revised methodology to enhance its monthly job reports, no doubt because its prior numbers simply were grossly inaccurate. Indeed, I stopped commenting on ADP numbers because I thought they were absurd.Let’s take a look at their revised methodology. Here is the ADP Jobs Report for September using the revised methodology. Got that? September private business sector increased by 162,000 but now we see September was revised down to 76,400 from 80,000 (not 162,000 as actually reported).Revision MatchingCheck out this statement from ADP FAQs.Using this methodology developed for ADP by Moody’s Analytics, our adjusted historical ADP National Employment Report data dating back to 2001 has a 96 percent correlation with the revised BLS numbers. ADP revisions match BLS revisions over time. Lovely. 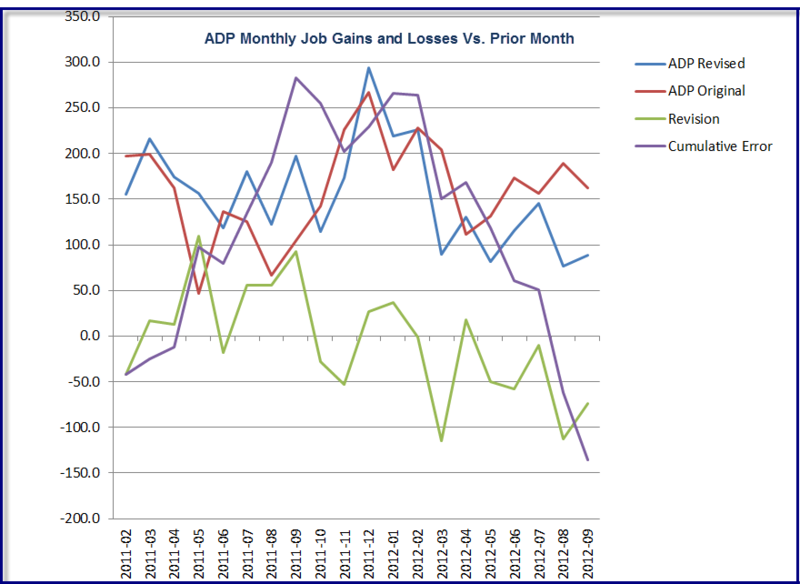 ZeroHedge totaled up the ADP revisions for 2012 and concluded ADP “Cancels” 365,000 Private Jobs Created In 2012. I conclude the same thing. However, things are even worse than Zerohedge states. Here is a chart that I put together of ADP revisions. Note: numbers in charts and tables in thousands. ADP was way underestimating job gains in 2011 and way over-estimated gains in 2012. The net effect was 136,000 jobs over 20 months (about 6,800 per month). However that is a very misleading way of looking at things as the following table shows. TrimTabs Investment Research said today that the Bureau of Labor Statistics’ (BLS) hefty upward revision of its August job growth estimate proves that the BLS missed the important acceleration in job growth this summer because it relies on incomplete surveys that are frequently revised. Trimtabs said the BLS’ initial estimate for August job growth was 96,000. Today, the BLS revised its August estimate upward 48% to 142,000 new jobs. Meanwhile TrimTabs estimate, based on real-time withholding tax data, said employment growth in August was 185,000. TrimTabs reported the U.S. economy added 210,000 jobs in September while the BLS reported a job gain of only 114,000. TrimTabs said it expects the BLS to revise its September jobs estimate of 114,000 substantially higher next month. I did not buy that story then, and I do not buy it now. More than likely, the BLS was catching up to misses earlier in the year, perhaps even 2011 vs. a genuine recent hiring spurt. Is Obamacare Responsible for the Surge in Part-Time Jobs? Prepping for Obamacare, Olive Garden and Red Lobster Cut Workers’ Hours; Are Other Companies Doing the same? By the way, these ADP revisions suggest the stated unemployment rate is blatantly preposterous, something I say in every jobs report.